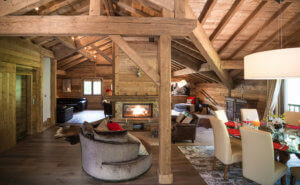 Chalet Pearl is a mountain lover’s dream retreat, and perfect for family holidays. 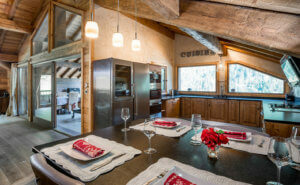 Located in charming Champagny, La Plagne – this self-catered chalet boasts space, comfort and jaw-dropping views. As if that wasn’t enough, Chalet Pearl also sits within one of the world’s largest skiing and hiking areas – the Paradiski. With five bedrooms and 400 metres of space Chalet Pearl can comfortably sleep up to 12 people. It’s easy to unwind after a long day on the slopes with luxuries like a heated boot room, Jacuzzi, hammam, bar and lift included in the chalet. Chalet Pearl’s location is an enviable one too. Sitting at the end of a sleepy cul-de-sac, it is just 700m from the Express gondola taking skiers to the slopes of La Plagne and onwards to the 225kms of pistes within the Paradiski area. If that isn’t enough skiing and snowboarding to keep you occupied for a week then Courchevel ski resort is just a 20 minute drive and access to the 600kms of pistes in the Three Valleys is possible from here. Snowcompare and our partners can supply private transfers from one of four airports direct to Chalet Pearl’s door. Taxis and minibuses for any size group – from 1 person to 50 are bookable using the Snowcompare website. Chambery airport is the closest to Champagny, but many travellers choose the busier Geneva airport in order to get cheaper and more convenient flights from around Europe and beyond. Grenoble and Lyon airports also provide a suitable access point in France for an onward journey to La Plagne and Champagny. If you are travelling to Champagny as part of a small group then shared transfers may be a better transport options. Snowcompare partners offer shared transfer buses between Geneva and Grenoble airports and La Plagne – where it is a short bus or taxi ride round to Champagny and Chalet Pearl.